Even the most sober-sided institutional interaction can be infused with ordinary human concerns, expressed in everyday terms. In this very welcome guest blog, Bethan Benwell casts a humane yet analytic eye over the talk that goes on in a highly charged medical encounter. Anyone who has ever had to go into hospital for elective surgery will know that there is a routine information-gathering process that patients have to undergo a few weeks prior to admission, which is usually called a ‘pre-operative assessment’. The assessment usually takes around 20-30 minutes, involves procedures such as taking blood pressure, ECGs and medical history gathering through a series of routine, usually optimised questions (e.g. ‘you don’t have any history of heart problems? Any recreational drugs at all?). However, as you might expect, interaction during these sessions is not exclusively focused on medical matters, but as with other types of service encounter, sometimes involves a good amount of ‘off-topic’ small talk too. Not only is chat about your holiday in Ibiza and the terrible weather in Scotland an ideal way of building rapport with potentially nervous patients, it also provides a tactful distraction from the embodied contact central to these sessions. How do patient and staff manage this off-topic material? Such talk has the potential to disrupt the medical agenda, and if not managed well, could make the encounter an unsatisfactory one for the patient. Indeed these pre-operative assessments were, according to survey data from one Health Authority, the subject of a particularly high number of complaints by patients. So, as part of a broader healthcare communication project conducted between my University’s departments of Health Sciences and English Studies, Dr May McCreaddie and I looked closely at what was going on. Could the management of small talk be to blame? An initial noticing about the small talk phases was that the boundaries between ‘on’ and ‘off-topic’ talk occasionally blurred and needed careful negotiation by both participants. Sometimes ‘off-topic’ phases emerge where the patient’s initially medically relevant response expands into a social sequence. So, for example, a patient might respond to a routine question about family history of heart problems with an extended discussion of his father’s recent health problems., While the nurse would be able to engage socially with this topic briefly, she must deploy her skills in returning the talk to the medical business at hand. Even more marked were instances where social talk began to evolve into personal disclosure and troubles telling which led to difficulties in the negotiation of sequence closure. In one extended sequence during a series of medical tests, a patient’s disclosure of personal material (about his grown up son’s mental health problems) during a social sequence transforms the ‘small talk’ into something more akin to ‘troubles telling’. What is fascinating here is how the nurse displays engagement and sympathy whilst subtly resisting the trajectory of ‘troubles talk’. This is largely achieved by minimal responses that acknowledge an on-going narrative but which do not encourage its expansion and also by recasting a troubles telling or negative news as something positive. Other studies (e.g. Beach 2003 on ‘managing optimism’; Holt 1993 on ‘bright side sequences’; Maynard 2003 on ‘good news exits’) have observed a relationship between positive recasting and a movement towards topic closure, and it is likely that our nurse here is deploying ‘optimistic projection’ as a way of managing the social talk that has emerged. Although these pre-operative assessments did attract more than their share of complaints, it seemed clear from our analysis that communication during these sessions was not where the problem lay. Indeed the nurses coordinating these sessions were almost without exception hugely skilled in their ability to negotiate the tricky transition from social to medical agenda. Beach, W. (2003). Managing Optimism. In P. Glenn, C.D. LeBaron & J. Mandelbaum (Eds. 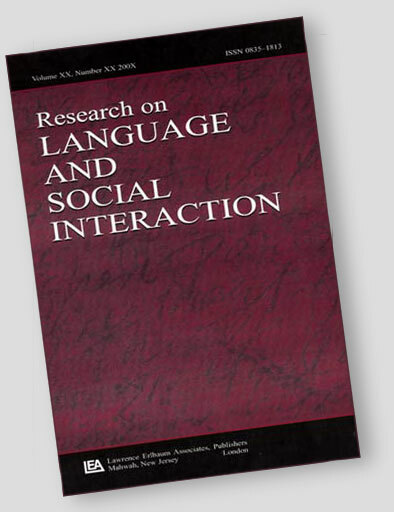 ), Studies in Language and Social Interaction: In Honor of Robert Hopper. Mahweh, NJ: Lawrence Erlbaum. Maynard, D. (2003) Bad News, Good News: Conversational Order in Everyday Talk and Clinical Settings. Chicago: University of Chicago Press.